Diet Pepsi has a different formulation in the UK, Australia, New Zealand, and other markets and thus has a lower caffeine content there. It contains 42.6mg per 12 ounce (355ml) can. How Does Diet Pepsi UK, AU, NZ Compare? 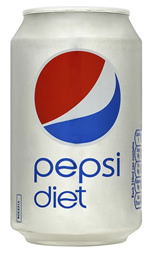 Diet Pepsi UK, AU, NZ contains 3.55 mgs of caffeine per fluid ounce (11.99mg/100 ml).